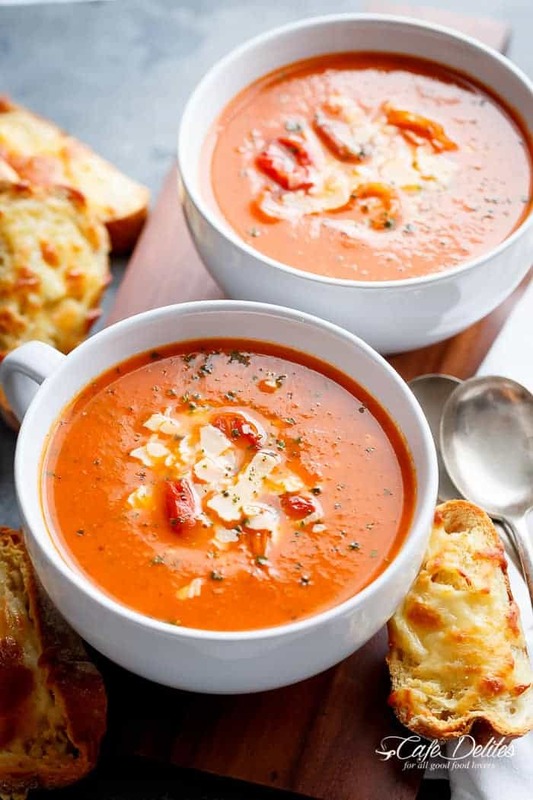 An easy and Creamy Roasted Tomato Basil Soup full of incredible flavours, naturally thickened with no need for cream cheese or heavy creams! 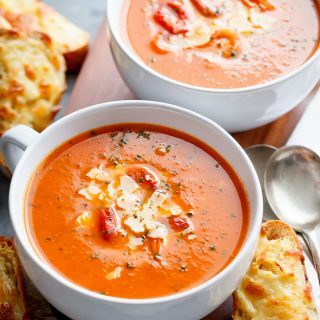 Ready in less than 30 minutes, our tomato soup recipe is loved by so many readers around the world! 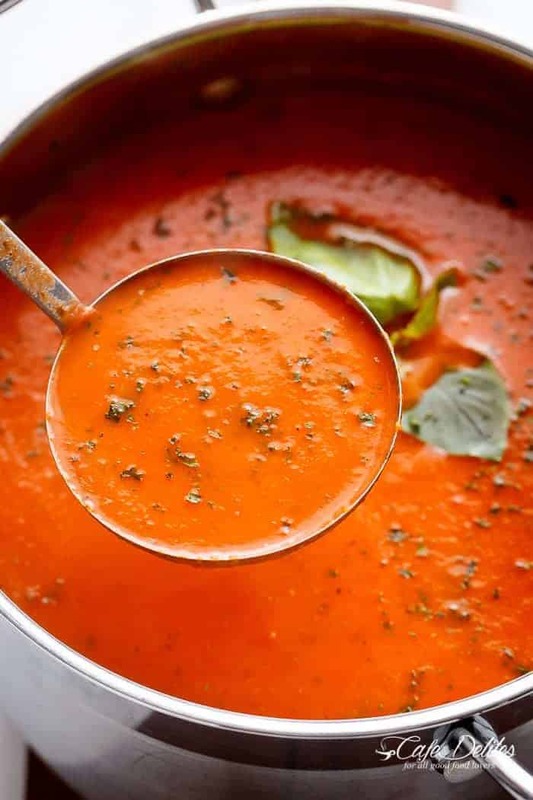 For kids to ask for this Creamy Roasted Tomato Basil Soup repetitively, it must mean something…right? Full of basil and a hint of garlic, this soup will most likely be on you weekly rotation, no matter the season. I garnished this soup with blistered tomato pieces, shaved parmesan and basil. Make ahead and freeze in advance OR serve immediately. This soup is the perfect start to a meal, or as a meal in itself. To get that creamy texture, I added in a secret weapon. No cream cheese or heavy/thickened creams are needed. Then there’s this recipe. 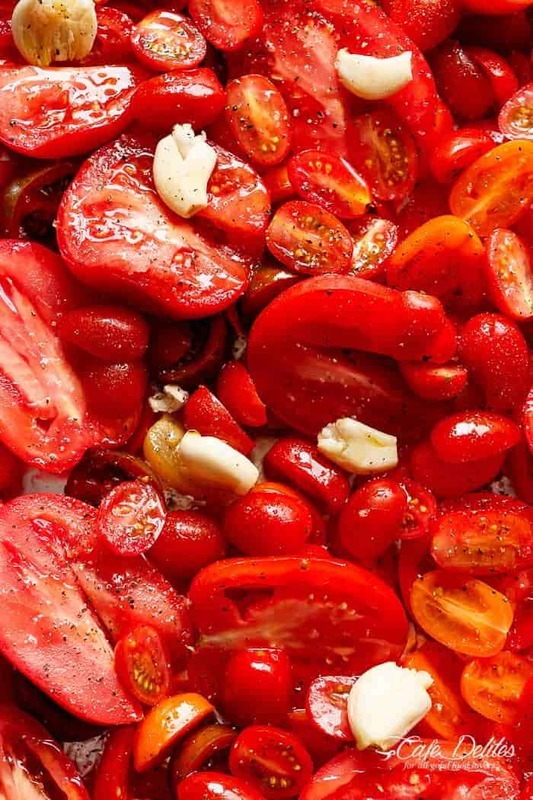 Going that extra step and roasting tomatoes along with whole (smashed) garlic cloves on a sheet pan until they’re soft and sweetened naturally with their own juices, develops a natural flavour incomparable to canned soup. Most people I know are completely turned off making tomato soup because if you can get it in a can, then what’s the point of going through all of the hassle of making your own, right? Not ‘neymore. The flavours in this soup cannot be found on any supermarket shelf. Any. Where. 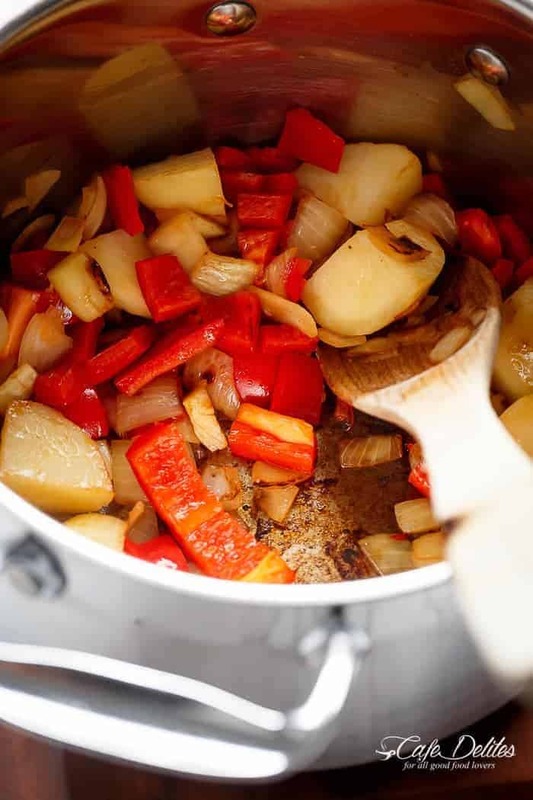 If using the potato, fry it along with diced onion and red bell peppers (capsicums), until the onion is transparent and the potatoes are beginning to crisp up adds even more flavour into this soup (while your tomatoes are roasting). Pour in your broth/stock and simmer the potatoes until they’re soft. Add the tomatoes once they’re done; add the basil; blitz with a stick blender, and viola! SOUP! No additives, preservatives or artificial colours/flavours, and homemade soup done in less than 30 minutes. Serve with grilled cheese or cheesy toasts — whichever works for you. And dip away, my friends. So thick and cream Roasted Tomato Basil Soup! The Garlic Cheese Bread in the video is found here. More Soup Recipes To Soothe Your Soul! Thank you for a great recipe! First time made a tomato soup. Totally loved it! This was a first for me. I had never made homemade tomato soup. I always stayed away from those recipes because of creams. But this recipe had potato so I tried it – I loved it and so did my husband. It’s a keeper!!! I followed the directions with only 2 changes – I had garlic already minced and I didn’t have fresh basil so I used dried. Still it was delicious. Can’t wait to make it again.!!!! Ver easy and delicious e en with winter tomatoes. And when u say two tins can tomatoes how much will that equal to how much cups or……..
It’s so easy and packed with flavor! I was worried that it wouldn’t be creamy enough but it definitely was. Thanks for this! Yes, that will work great too. I made this soup today and it was wonderful, I did do a little tweaking with it but not much. Our garden is gone except for a few large cherry tomatoes that are still producing so since I had quite a few I decided to roast them in the oven with some garlic and basil and a little olive oil, then I pureed everything until it was smooth. I used a sweet potato since recipe did not specify and added extra garlic powder and about a 1/2 cup of Port Wine, I also added some bouillon, let it all simmer and served it with grilled ham and Fontina cheese sandwiches with a few Frito chips on the side to drop on top of the soup. It was a hit with the husband, I have plenty left over for another meal which I am looking forward to! Thanks for the recipe it was perfect timing for me. I will make this one again! The soup looks so good. I love tomato soup n the color is beautiful. I’m going to try this for my kids but I think I’ll make it without the tomato paste. Is it possible to make this tomato paste? I am sure you are able to make your own tomato paste! That sounds great! Let me know how it turns out! Enjoy!! What is a humble potato and can a regular russet or Yukon gold work? A regular or Yukon gold potato works great! It will help thicken the soup for you! Enjoy!! This is what I have found when I googled it: If you don’t have it: Substitute 1 tablespoon tomato paste with 2 to 3 tablespoons tomato puree or tomato sauce (reduce liquid in recipe by 2 to 3 tablespoons); or boil tomato puree or sauce until reduced to 1 tablespoon. Hope that helps! Enjoy! What makes the sodium so hi? I am restricted on sodium. Looks so yummy. I love tomato soup and cannot eat the can ones anymore. Since the recipe doesn’t specify, the sodium content probably comes from the vegetable broth. When you look at the side of a container of store-bought broth, it tends to be a frightening percentage of the daily recommended intake. Buy no-sodium broth! You can pretty much find it everywhere. I usually purchase it from Walmart. I’m not able to view the recipe? Thank you for letting me know! I am so sorry that the recipe went missing! My site had a malfunction for a period of time today and we are just getting things up and running. I apologize for the problem and how long it took. Thank you for your patience and following along with me! If you have any other questions or concerns please email me and I would love to help in any way that I can. 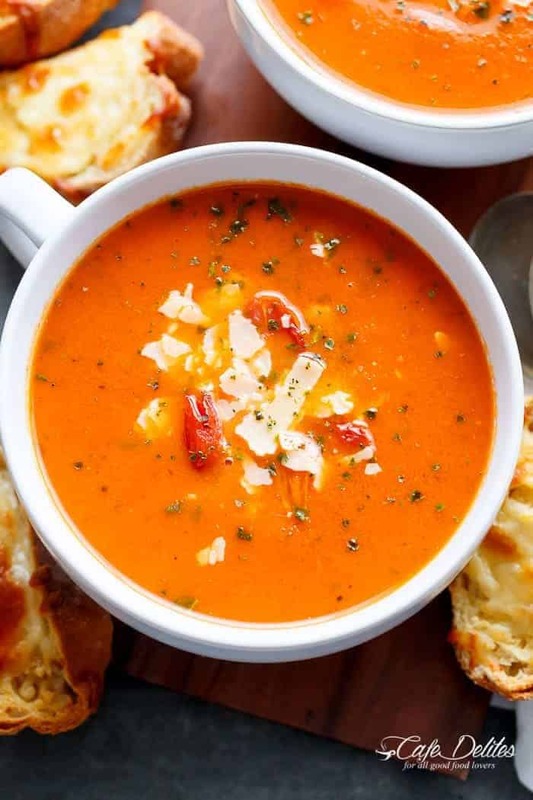 XOXO Here is the Creamy Roasted Tomato Basil Soup Recipe: https://cafedelites.com/creamy-roasted-tomato-basil-soup/. That is awesome to hear! Thank you for the tag and for sharing with everyone! I really appreciate it! Thanks for following along with me! I am so glad that it was a good soup for you! Delicious Tomato Soup!! I used 1 drop doTERRA Basil essential oil, instead of the 2 c fresh basil. I love the short list of ingredients! That sounds delicious! Great idea! Thank you for sharing! Have you or anyone ever canned this and if so did you use the water bath method or a pressure canner. This is definitely the best tomato soup I’ve ever cooked and tasted! Love it and will definitely make it again and again. Thanks so much for sharing the recipe, Karina. AWE!! Thanks so much! I really appreciate it! I am glad that you loved it so much! This was GREAT. I was skeptical about the potato adding creaminess, but it worked!!! I added a diced carrot to help with the sweetness. My son, who is adverse to soups have this a BIG “thumbs up”!!! Definitely, this will be a repeat meal. YAY!! That is awesome! I am so glad that it worked and you got two thumbs up! This was amazing!! ThAnk you for sharing this recipe this one is a keeper ? This came out SO good!! I only embellished, not changed. I fireroasted and peeled the red pepper before I added it to the mix. I also added a handful of chopped sundried tomatoes. Super thick! It has that “creamy” consistency with the cream. Fantastic soup, I did better the second time. The first time I didn’t roast the tomatoes long enough and it was a little watery. I made this tonight along with the cheesy toast. My 5 year old son who is a self proclaimed hater of all soup ate his ENTIRE bowl and said it was the best thing he’s ever eaten!!! It’s a definite keeper!! THANKYOU!!! Very good recipe. I added a little Greek seasoning to the mix. I don’t make soups often but this one was good. YUM! I love that addition! I just made this. I ended up throwing it all raw in the crock pot on high for 6 hrs and it turned out delicious and was super easy! I will definitely make this again. This looks delicious! I found your blog through this recipe on Pinterest. I can’t wait to try this and also explore your blog some more. Everything looks so good!! I am allergic to garlic, but love tomato soup…do you have a suggested substitute? Can you use cauliflower in stead of potatoes? Whaaaat?! How did I not think to do that combo! Trying it now…thank you for the tip Mary! I LOVE this soup and make it for Christmas presents every year! Is there any way I could get the nutritional information? I will try very soon Morgan! Can you can this great soup. I see you only say freeze, just wondering if you have canned this soup? Previous comments talk about 2 potatoes. This ingredient list shows 1 potatoe. Which is it? Delicious!! Made it with Basil Pesto instead of fresh. Hubby loved it and I took 2 bowls to work to share with my boss…. she loved it too!! Keeper!!! Do you by any chance know what the carb count is for this soup? I’m looking for low carb options and love tomato soup, but the potato addition may not make this possible. I adapted this for my Instant Pot. It turned out wonderful, rich flavors perfect for lunch with sour dough cheese toasts. Thank you for the recipe. My changes for instant pot instructions, sauté onions, red pepper and potato in IP. Add 4 tsp Better than bouillon vegetable base and the tomato paste to the onion, red pepper and potato. Add the 4 cups of water and all the roasted tomatoes and garlic to the IP. Pressure cook for eight minutes then QR this will take 4 minutes. Open pot add the basil mix well until basil wilts and blend with immersion blender. Yummy! This soup looks great! Do you have a recipe for the cheese bread also? LOOOOOVE this. It’s quite a big batch so I freeze the leftovers and use them for everything! In pasta sauces, make another kind of soup, the possibilities are endless! Hi Karina – When you say 2 potatoes (200g/7 oz), do you mean 7 oz each or 7 oz total? LOVED the soup, next time I will sprinkle a little raw sugar on the tomatoes before roasting, and I didnt have enough fresh basil! Next time I will put the correct amount in. It was still AMAZING !! I didn’t peel the taters, and left the skin on the tomatoes also. What a great recipe!! I am thinking I may throw a jalapeno in next time??!! I just made this as part of a vegan Easter lunch spread for my family. I added Yves brand “meatballs”, and turned it into meatball soup and paired with some pressed Italian sandwiches and Caesar salad. So beyond delish! Thanks so much for sharing…will be having this on the regular. ? How many does this recipie serve. Can’t wait to make this. I will also make a grilled Cheese sandwich and cut into bite size pieces to use as croutons. Before I grill the sandwich, I pat grated parm. cheese into the butter. Gives a nice crunch. What kind of potatoes should I use? Thanks! Amazing recipe! I left out the red pepper and used dried basil, but still very, very good. I can’t wait to make it this summer with fresh tomatoes from our garden (and fresh basil)!! Thank you Regina! I’m so glad you tried it! I definitely have to make another batch! Have a wonderful new year! And thank you for your feedback! I made this soup for a Christmas dinner I am hosting with alot of picky eater including a pescatarian so I was desperate to find something good…. and boy did I! I don’t like tomato soup normally but this was great! Not too much tomato or tangy like they normally are. I made the recipe as is and it came put superb…. the only thing extra I did was add extra garlic as we love it at our house as well as I put it through a mill after I pureed it to get rid of all the skin and grainy texture- definatley more work this way but so worth it. I love this recipe! I made it for dinner this evening and my husband and little girl loved it too. Great idea for substituting the starch for the cream . I let the tomatoes cool then peeled them prior to adding them to the soup. I will definitely make this again. Made this last night and it was so good! It was also easy to prepare. I used a big frozen basil cube from my summer basil. THANK YOU, THANK YOU THANK YOU. I made the soup today, followed the recipe to the letter…and I loved it, YEP me the NOT loving tomatoes one LOVED IT. I made this as a gift for my DH Aunt who is home recovering from a stroke, she complained that the hospital food was so disgusting…lacked flavor and depth…lol…this hit all those points and then some. I am saving this recipe to alter with shrimps and lobster, as its reminds me of the bisque base of soups i love. Everything pulled together so well and the layers of flavor like you mentioned by roasting the tomatoes was the key. I’m freezing and delivering tonight. I enjoyed making the soup too….not what to do with the leftover basil…besides pesto. What an easy recipe . This is the best tomato soup I ever made. This is going to be a staple at our house. Thank you so much. Came out a little salty so next time I will use water instead of stock…very good feedback from the family. I cannot wait to make this!! Did you use russet potatoes or a different variety? I love this soup. I made it last week and I” making it again today with one change. I will add carrots instead of a pepper. I’m wanting to make this for my family of 4 (including myself), how many servings is in this recipe? And it looks SO GOOD by the way! Just made this, used all farm and garden ingredients. It is absolutely delicious!! I made this soup yesterday. Delicious! It has such a creamy mouth feel that you would swear there was dairy in it. It’s a super was to use up tomatoes. The next time I make this I will roast the tomatoes with a couple of pinches of sugar. Thanks for posting. I’ve only recently liked tomato soup…as a child I found the Campbell’s tomato soup repulsive and very much like Chef Boyardee. 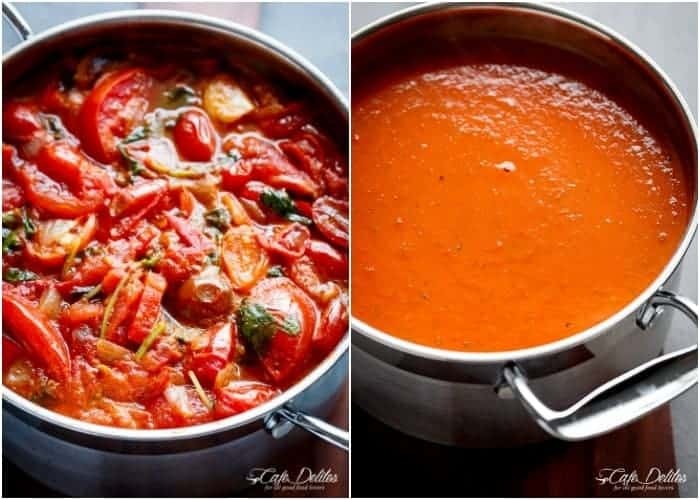 I haven’t tried this recipe yet but from the ingredients to the beautiful photos it looks like the best recipe for tomato soup I’ve come across yet….AND…since there’s no dairy it can be canned! I cannot wait to make this soup, thank you so much for posting, tomato soup now has another dimension! Made this today with fresh garden tomatoes. Hubby said it is restaurant quality and it is. Thank you. So glad I made it! Haven’t made tomato soup in a very long time and was glad this recipe did not fail. My 10 year won’t lie no matter how much he loves his mom said this is the best soup he has ever had! Well that’s all I needed to hear. Thank you for sharing. Just finished making this and hate I’m headed out to dinner! This was the only time I had to cook it and I had already roasted the tomatoes a couple of days ago before they went bad. It is so good. I can’t wait ’til lunch tomorrow! and it’s beautiful! I love tomato soup, but this is my first time making it. Thank you so much for sharing. I will definitely be making again. This soup looks amazing. I am looking for something to do with my excess garden tomatoes, thinking this is the answer and I will freeze to have on hand this winter after my baby arrives! Yay Jacqueline! I’m so happy to hear that! This soup recipe is so easy and delicious! I love the roasted flavor. I can’t have milk so love the fact that the potatoes thicken it so nicely. For anyone interested in canning this soup, I canned a batch using my pressure canner (pints at 10 lb. pressure for 30 minutes) and it worked great! I got 5 pints from this recipe, but plan to use up my end of season tomatoes and make more to get us through the winter. That’s so great Sue! Thank you so much for the tip! This looks delicious, I think I might use butternut squash instead of potato to make it WW friendly. Wow! I made this today for dinner along with grilled cheese sandwiches and it was like no other tomato soup I’ve ever had! So delicious packed with lots of flavor and boy oh boy super easy to make! Thank you for this amazingly delicious recipe! This might be a silly question but I’m using fresh potato. Should I peel it?? Can this be canned?! What is the processing time and would I waterbath it or pressure can it?! It sounds super yummy!! Hi Megan. I haven’t canned this soup so I really can’t give you any advice, I’m sorry! This is a fabulous recipe, it is the 2nd time i have made it. The potato, onion, peppers give such nice layers of flavor. We make homemade croutons from sourdough bread to put on top. Thank you for the recipe. The kids loved it too and that is a win for me ? I’ve just made this soup for a light Sunday dinner. It’s lovely, the potatoes thicken it without the cream! I usually make another tomato, red pepper and basil soup from Good Housekeeping recipes but this is less mess (no having to skin the tomatoes). I added a sprinkling of dried chilli flakes just to give it a bite. This will definitely by a family favourite. Thank you ? A lovely soup, Karina. Thank you. Hi! Can’t wait to make this recipe! How did you prepare your cheesy bread in the picture? I just made the soup and I seriously LOVE it!! I added a little bit cayenne pepper and some tabasco to make it a bit more spicy. I am following your blog for a while now but haven’t cooked your dishes yet but the soup was a big success and a bliss for my palate so I will probably try some more soon!!! That’s so awesome Isabelle! I’m so happy you tried it! ? Sounds amazing and can’t wait to try it. Esp since I found canned tomato soup has high fructose corn syrup. Not an ingredient I want my toddler gobbling up. My question is can you make ahead and freeze? I love to make my own foods but never sure about freezing and defrosting. I would love any tips. Hi Leslie! Yes definitely! Make ahead and freeze meals is something we also do often, and this soup is perfect for that 🙂 I usually freeze mine in air tight containers, and the day of serving I leave it out to thaw in the morning; pour it out into a pot and reheat before serving. I found this recipe last night and just finished my second bowl! Only reason I’m not having a third is because I promised my health advocate I’d control my portions. I made this exactly as you said except I had no fresh basil so I used dried. Looking forward to making it when my basil grows. I loved the texture, as well as the flavor of the roasted tomatoes. I thought it might be too much garlic but it was perfect.In fact I made some cheesy garlic bread to dip. Thank you for a recipe that is not only delicious but easy to make as well. I’ll take soup, especially tomato soup, any time of the year. Honestly, never tried with roasted tomatoes though. Will definitely do that next time. Thanks for inspiration! And your photos are absolutely drool-worthy. I’m craving a tomato soup now!! This soup…this soup! OMGoodness! Gorgeous! You have a winner here…..making soon, even if I have to turn the AC to freezing. 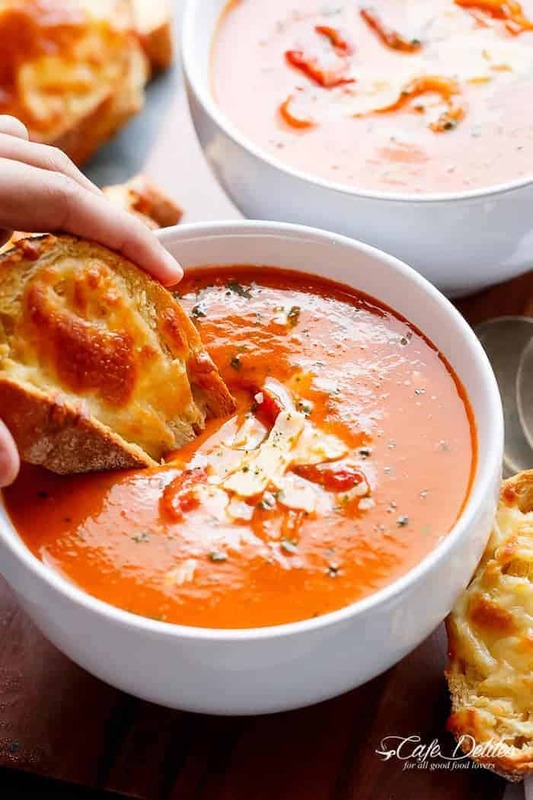 Cheesy toast looks perfect with this soup. Pinned. Thanks for sharing.